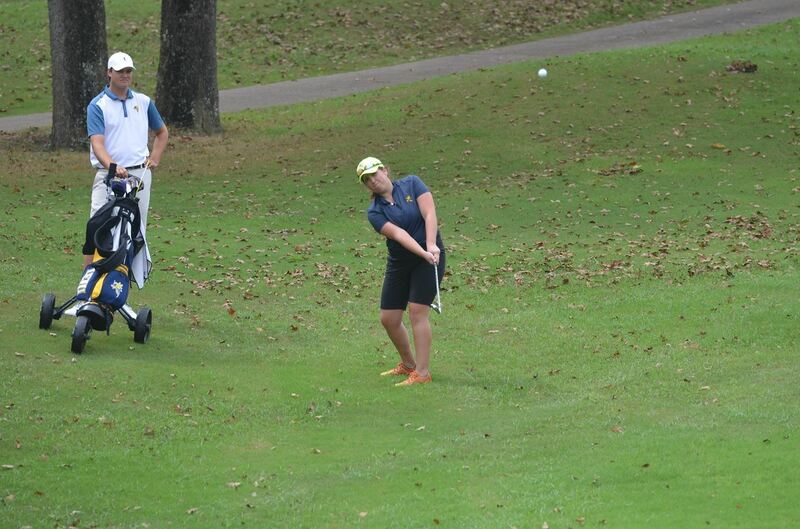 LeTourneau Women’s Golf Moves Up To Seventh After Day Two of ASC Championships. GLEN ROSE, Texas – Improving on their team scoring round by four strokes, the LeTourneau University women’s golf team would move up the leaderboard one spot to six in seventh-place after day two of the 2019 American Southwest Conference Women’s Golf Championships held at Squaw Valley Golf Course in Glen Rose, Texas on Saturday, April 13. LETU would finish the day with a team score of 354, and currently has a two-day team total of 712. The University of Mary Hardin-Baylor extended their lead after shooting a 325 and has a two-day total of 641 and is followed by Texas-Dallas (657) and Concordia University Texas (661). Individually, freshman Baylee Van Houten would tie for the low score of the day with a six-over 78 with a round that included three birdies and an even-par 36 on the back-nine of the course. Van Houten is tied for 13th with a two-day total of 167 while junior Brittany Taylor followed up an opening-round 84 with a round of 94 for a two-day tally of 178 and is tied for 27th. 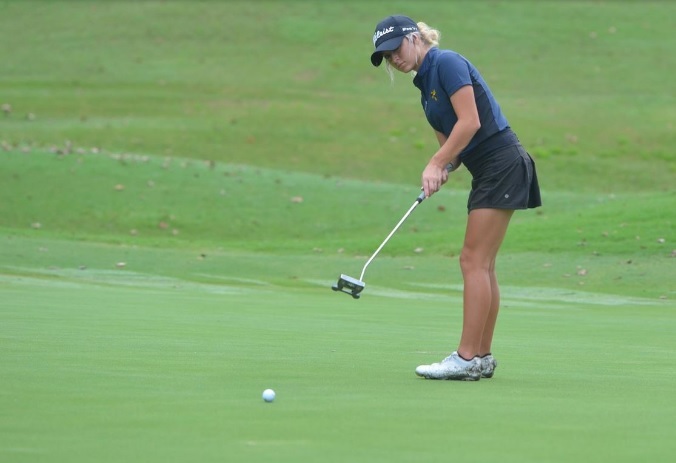 Both Shelby Allen and Rachael Green would also make a move up the leaderboard for the YellowJackets as Allen shot a round of 88 for a 180 two-day total in 29th place while Green is in a tie for 35th after a second-round 94 for a two-day mark of 187. One final chance to put up scores in the 2018-19 season will feature LeTourneau playing in the final round of the ASC Championships on the 5,846 Par-72 Course. Tee-times will begin at 8:30 a.m. tomorrow morning with everyone getting in one final 18-hole round to put towards the team total. LeTourneau Men’s Track Takes Fifth At East Texas Invitational. 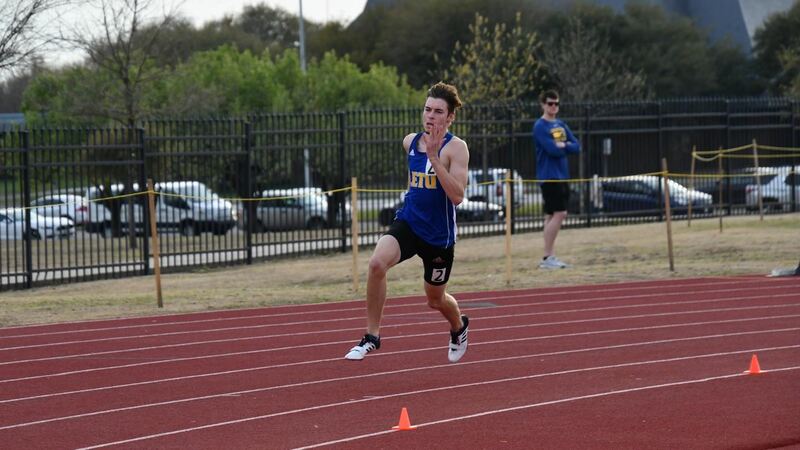 COMMERCE, Texas – Behind five school-record performances, the LeTourneau University men’s track and field team managed to finish in fifth place at the East Texas Invitational hosted by Texas A&M Commerce in Commerce, Texas on Friday, April 12. LETU would finish the two-day meet with 53 points, just one point back of Dallas Baptist who took fourth with 54 points. Host Texas A&M Commerce won the event with 205 points and would be followed by Tarleton State (111.50 points) and Texas College (69.50 points) to round out the top three. School-records would be set by Javaughn Dantzler in the triple jump (13.58 meters, 44 ft. – 6.75 in. ), Stanley Williams in the 100 meters (11.03), Lorien Nightingale in the 800 meters (2:03.26), Solomon Siniard in the 200 meters (22.25), and the 4×100 meter relay team consisting of Collin Jones, Jack Miller, Siniard, and Williams (42.98). The top finish of the day for the YellowJackets would come from Keishaun McMillian with a third-place finish in the javelin (43.41 meters, 142 ft. – 5 in.) while Alex Hindman took fifth (41.52 meters, 136 ft. – 3 in. ), and Adrik Kling in eighth (38.08 meters, 124 ft. – 11 in.). LeTourneau’s only other field event result of the day would come courtesy of Arvin Hrushka in the high jump (1.75 meters, 5 ft. – 8.75 in.) before the senior would go on to compete in the 110-meter hurdles (17.07) alongside Colton Pounders (17.03) and Jones (17.16). Pounders (57.00), Jaylon Williams (59.93) and Hrushka (1:00.95) all competed in the 400-meter hurdles while Evan Koehler ran a time of 11.69 in the 100-meter dash in his only event of the day. Also competing for LETU Friday, was Jones (22.72), Dalton Heichelheim (23.18) and Miller (23.88) in the 200 meters. LeTourneau’s 2019 outdoor season success will be put to the test next weekend when the YellowJackets compete in the 2019 American Southwest Conference Men’s Track and Field Championships which will be hosted by Hardin-Simmons University in Abilene, Texas April 19-20. Last season, LETU would finish in seventh-place while scoring 49 points with Austin Parrish becoming the first ASC Champion in school-history (pole vault). 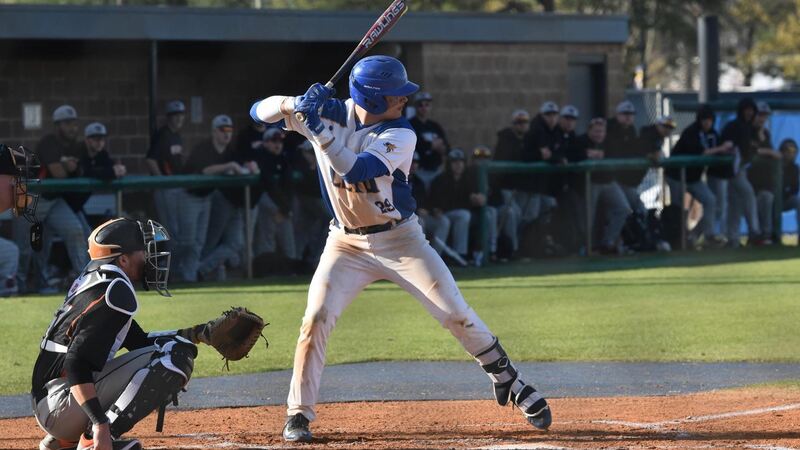 LeTourneau Baseball Splits Pair Of One-Run Games With Howard Payne. LONGVIEW, Texas – A day after pulling out an extra-innings win, the LeTourneau University baseball team would split a pair of one-run games by winning 7-6 in eight innings before falling 5-4 in the series finale to Howard Payne University at Conrad-Vernon Field in Longview, Texas on Friday, April 12. Grabbing two of three games from the American Southwest Conference leaders, LETU is now 20-14 overall and 9-6 in the ASC while Howard Payne remains atop the conference at 21-12 overall and 14-4 in conference action. Howard Payne made the most of a leadoff single in the top of the first as a stolen base and groundout would put HPU in position to take a 1-0 lead off an RBI single. LETU would get out of the inning with a double-play as the lone run ended up being the only run through the first three-plus innings of the game. Trailing 1-0 in the bottom of the fourth, LeTourneau would put five of the first six batters of the inning on-base as Noah Mahoney would drive in Bryce Brueggemeyer to tie things at 1-1 before a Will Bradshaw fielder’s choice and Kyle Guevara RBI single put LETU up 3-1. LeTourneau would wind up stranding two runners however as HPU would limit the damage going to the fifth. After a single-run by Howard Payne in the top of the fifth, LETU would manage to add to their lead in the bottom of the sixth by taking advantage of three hits and a Howard Payne error to score Cody Lee and Guevara to put LeTourneau up 5-2. It would appear to be all for not however as Howard Payne responded with a two-run home run to pull within one at 5-4 with just one out in the top of the seventh. Following a hit batter, HPU reclaimed the lead on their second two-run homer of the inning as it would be LeTourneau who would have to make a comeback in the bottom of the seventh to try and extend the game. A Brueggemeyer leadoff triple got things started for LETU as a Mahoney sacrifice fly knotted the game at 6-6, with things eventually going to extra-innings for the second-straight contest. In the extra frame, HPU would be held hitless before seeing LeTourneau make the most of a hit batter as Lee Hosie would steal second on a strikeout to allow Brandon Ramirez to play the role of hero with a game-ending RBI single to center field. Earning the victory in relief would be Raul Martinez after throwing the final 1.2 innings of the game and striking out two while not allowing a hit to Howard Payne. A 10-hit outing for the LETU offense would be paced by Brueggemeyer, Mahoney, and Guevara with a pair of singles each as the trio combined for three RBI. The offense once again appeared to be limited in the early going for both HPU and LETU as the game would feature only one run through three innings of play. The runner would come in the bottom of the second as Bradshaw would be hit by a pitch to lead off the inning and move around the bases on a Guevara single, Lee sacrifice bunt, and Jacob Jones sacrifice fly. Things would be broken open by Howard Payne in the top of the fourth as four hits, and a LeTourneau error would lead to five runs to knock out LETU starting pitcher Andrew Harlan from the game. Mahoney would help LeTourneau get a runner back in the bottom half of the inning on a solo home run to make the score 5-2 in favor of Howard Payne going to the fifth. LeTourneau would appear to manage a two-out rally in the bottom of the fifth as Ramirez would drive in Hosie to cut the HPU lead to two. A strikeout on a passed ball would extend the inning as Brueggemeyer would reach first and see Chaz Jackson race home from second to make the score 5-4 in favor of Howard Payne. The defense would then step up for LeTourneau with a one-two-three inning in the sixth before LETU would strand the game-tying runner at second as HPU maintained their one-run lead. A chance for Howard Payne to extend their lead in the top of the seventh would be thwarted as a leadoff single and walk would be followed by a strikeout, flyout, and lineout to keep things at 5-4. Put in the same position as game one of the doubleheader and needing a run to extend the game, LETU would be unable to put a runner aboard as Howard Payne would grab the final game of the series with all three games decided by one run each. Despite out-hitting Howard Payne 7-5 in the game, LETU would be unable to make the most of their four stranded runners in the contest as five strikeouts also did not help their cause. The seven hits would come from seven different players for LeTourneau with most of the damage arising from the middle part of the lineup. A short week due to Easter finds LeTourneau traveling once more in the regular season as the YellowJackets go to Austin, Texas to take on Concordia University Texas in a three-game series. Game one will take place at 4:00 pm on Thursday, April 18, and will be a doubleheader against the Tornadoes. LeTourneau Men’s Tennis Caps Off ASC East Division Title With 5-0 Win At Louisiana College. PINEVILLE, La. 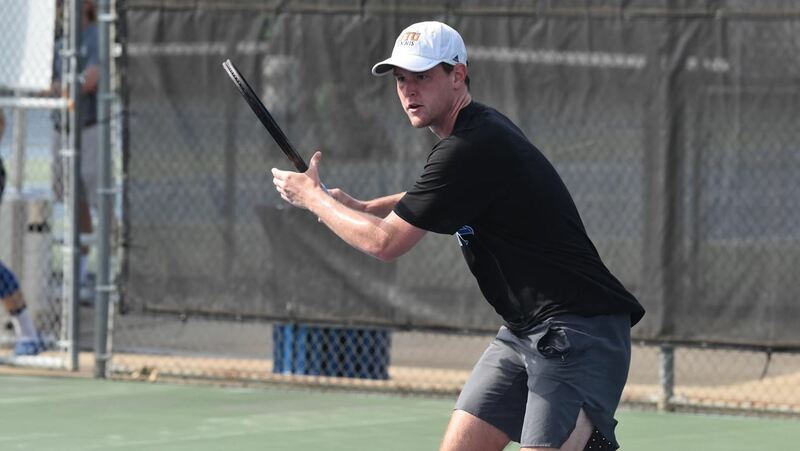 – Leaving no doubt on their 2019 American Southwest Conference East Division Title, the LeTourneau University men’s tennis team conceded a total of three games in a 5-0 road win at Louisiana College in Pineville, Louisiana on Friday, April 12. With their fifth-straight victory, LETU is now 11-6 overall and finishes a perfect 4-0 in the ASC East while the Wildcats slipped to 2-8 overall and 0-4 in the ASC East. All three doubles matches would finish with 8-0 scores in favor of the YellowJackets as Jimmie Henson, and Christian Farris would team up at number one doubles, Zac Crowley-Kurth, and James Estrada at number two doubles, and Nathan Schmidt and Bobby Clark at number three doubles putting LETU up 3-0. Singles play would only feature two wins for LeTourneau to clinch the match as the other four games would go unfinished due to rain and the team match being secured. LETU’s two wins would come from Farris at number two singles with a 6-0, 6-0 victory and Schimdt at number four singles after his opponent withdrew following a 6-0 first set victory from Schmidt. Matches that were started but unfinished due to the game being clinched saw Henson lead his number one singles match by a score of 6-3 while Crowley-Kurth was up 6-0, 4-0 at number three singles. Paulo Cressio and Clark were scheduled to play at number five and six singles but did not start their matches. The regular-season finale will bring Texas-Tyler to Longview as the YellowJackets will host the Patriots in a 4:00 pm match on Monday, April 15. The game is scheduled to be the final match between NCAA Division III opponents as Texas-Tyler is in the first season of NCAA Division II Reclassification. LeTourneau will host the 2019 American Southwest Conference Men’s Tennis Tournament, which will take place April 25-27 at the Davis Tennis Courts in Longview. More information regarding the tournament will be released as it becomes available, including the full eight-team tournament field. LETU’s first-round opponent is still being determined but will be the number four seed from the ASC West Division as the match is scheduled for a 4:30 pm start on April 25. LeTourneau Women’s Tennis Takes 9-0 Road Victory At Louisiana College. 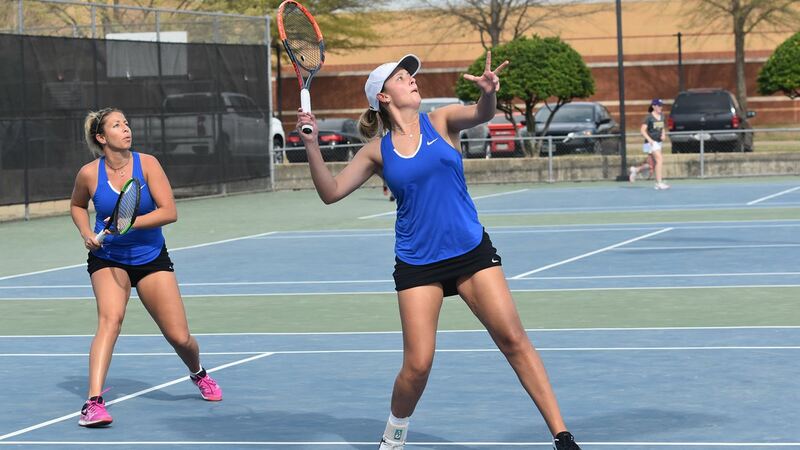 PINEVILLE, Louisiana – Carrying over momentum from Wednesday’s road win at the University of the Ozarks, the LeTourneau University women’s tennis team had no problems downing Louisiana College by a final score of 9-0 in Pineville, Louisiana on Friday, April 12. LETU now sits at 8-8 overall and concludes American Southwest Conference East Division play 3-1 while the Wildcats fall to 3-9 overall and 0-4 in ASC East play. Due to Louisiana College only having three available players, the YellowJackets would get default wins at number two and number three doubles to go along with default victories at number four, number five, and number six singles. The only doubles match of the day would see Katharine Waldthausen and Maddison Brackenreg win 8-0 before both would win their respective games at number one and number two singles 6-0, 6-0. LETU would also get a 6-0, 6-0 win at number three singles from Gracie Favela to finish out Friday’s action. Originally scheduled for Saturday afternoon, LeTourneau will now host Texas-Tyler at 4:00 pm on Monday, April 15, to close out their 2019 regular-season. With conference play done for the YellowJackets, LETU will finish no worse than second in the ASC East for next month’s ASC Tournament which will be hosted by the number one seed from the West Division. LeTourneau Women’s Golf Led By Brittany Taylor On Day One Of ASC Championships. GLEN ROSE, Texas – Posting a team score of 358, the LeTourneau University women’s golf team would be led by junior Brittany Taylor in the opening round of the 2019 American Southwest Conference Women’s Golf Championships held at Squaw Valley Golf Course in Glen Rose, Texas on Friday, April 12. At the end of day one, LETU is in eighth-place, 10 shots back of McMurry University who is in seventh after a round of 348. Mary Hardin-Baylor leads the nine-team race with an opening round 316 and is followed by Concordia University Texas (321) and Hardin-Simmons University (329). Taylor’s low-individual round for the YellowJackets finds her in a tie for 16th after an opening round 84 on the 5,846 Yard, Par-72 course with a front nine score of 41 to go with a 43 on the back nine. Baylee Van Houten is tied for 30th after firing an opening round 89 for LETU, while Shelby Allen is tied for 36th after a series of 92. Just one shot back of Allen in 38th is Rachael Green following an opening-round 93. Tomorrow’s second-round action will get underway with a 1:30 p.m. shotgun start and will consist of 18 holes for all nine teams. LeTourneau will look to put themselves in position to make a final round push, with the 54-hole tournament coming to a close on Sunday. LeTourneau Tennis Holds Steady In ITA Regional Rankings. 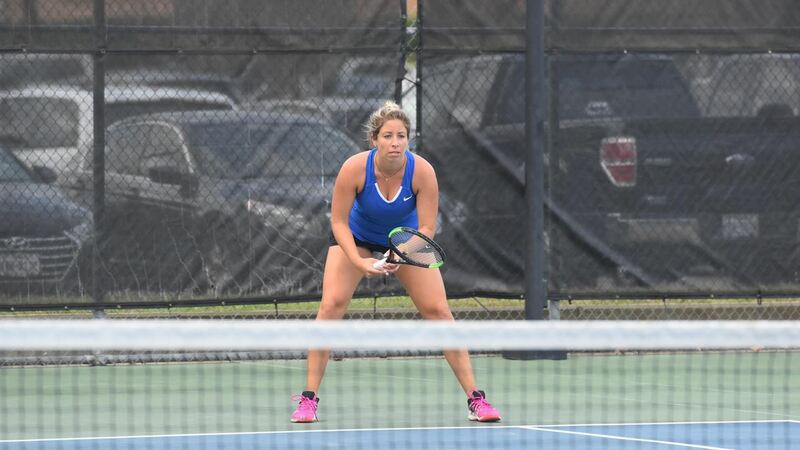 LONGVIEW, Texas – Preparing for their last two matches of the regular season, the LeTourneau University tennis teams have held steady to hold their ITA West Regional Rankings, as released by the ITA on April 11. The LeTourneau men are in the ITA West Regional Rankings for the second time this season, coming in at number 19 as one of four American Southwest Conference teams in the regional standings. Since the previous ITA poll on March 28th, LETU has gone a perfect 3-0 with victories over Belhaven University (7-2), East Texas Baptist University (8-1), and the University of the Ozarks (9-0). Sitting at 10-6 overall and 3-0 in ASC East Division play, the YellowJackets have clinched the ASC East Division Title and will host the ASC Tournament April 25-27. On the women’s side, the YellowJackets have won two of their past three matches to have found their stride as of late after having won four of their previous five games and five of their last seven to sit at 7-8 overall and 2-1 in the ASC East. Continuing their recent run of strong play has been the doubles duo of Katharine Waldthausen and Maddison Brackenreg who find themselves ranked the number 13 doubles duo in the ITA West Region for the second consecutive poll. Waldthausen and Brackenreg have won six straight matches and are 10-4 overall this season at number one doubles when teaming up together. The next ITA regional rankings will be released on Thursday, April 25th, and will coincide with the start of the 2019 American Southwest Conference Men’s Tennis Tournament. LeTourneau will play two more matches before the next rankings, with games against Louisiana College and Texas-Tyler concluding the regular-season for the men and women.